A newer version of this item is available. It is replaced by the Datalogic Heron HD3100. Datalogic is proud to introduce the Heron G, the new DATALOGIC Handheld Reader developed to provide high performance with an appealing design. 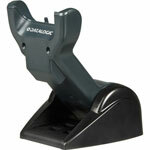 The result is a gun shaped reader that is compact, robust, easy to handle and lightweight. 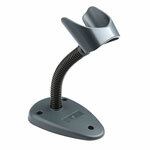 Its simplicity of use and ergonomics make it suitable for retail, commercial and office applications. The Heron G is based on Datalogic's core technology, CCD, which is unsurpassed for reading in retail applications. The CCD reader is also provided with a green spot (Datalogic patent) guaranteeing good reading feedback directly on the code, which is very useful in noisy environments. A single multiple interface model (Wedge, USB, RS-232 and Wand) provides flexibility and full compatibility with the different systems by simply replacing the plug-in cables. 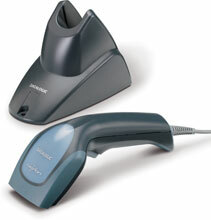 The Heron G as well as all the Datalogic barcode readers has undergone a variety of tests to assure that it can withstand daily use in standard operating environments. The tests done in DATALOGIC's research departments and quality assurance laboratories result in a reader that is long lasting and meets all the requested quality standards in the market. In addition, Heron G reads Reduced Space Symbology (RSS), an emerging symbology that can be printed on smaller labels, meeting emerging market needs for a larger amount of data on a single code. Heron, Includes handsfree stand, and product reference guide. Color: Gray. Scanner Only - Cables and accessories must be purchased separately. These include USB (Part# 90A051945), PS/2 (Part# 90A051360), or RS-232 Serial cables (Part# 90G001070) and a Power supply (Part# 90ACC1893).